Kicking over the "Terra Rossa" and more. We have hand picked our team that consist of staff who are driver/reference/knowledge base/consultants with experience across five (5) continents and most popular (and some not so popular) varietals. We can take you further afield than most operators. Have you ever considered visiting "the dress circle of Melbourne" (James Halliday, Australian Wine Companion). Maybe you have thought about kicking over some of the famed "Terra Rosa" of the Coonawarra. 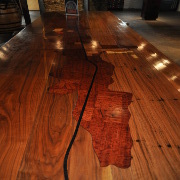 Have you ever longed to see the home of fortified wine in Australia. Just remember, "Sydney may have a nice harbour but Rutherglen has a great port!" (a sign at the entrance to the Rutherglen Wine Region). Our team have long standing relationships with wineries in South Australia and Victoria, as well as knowledge of wine regions in South Africa, New Zealand, Europe and the U.S.A.